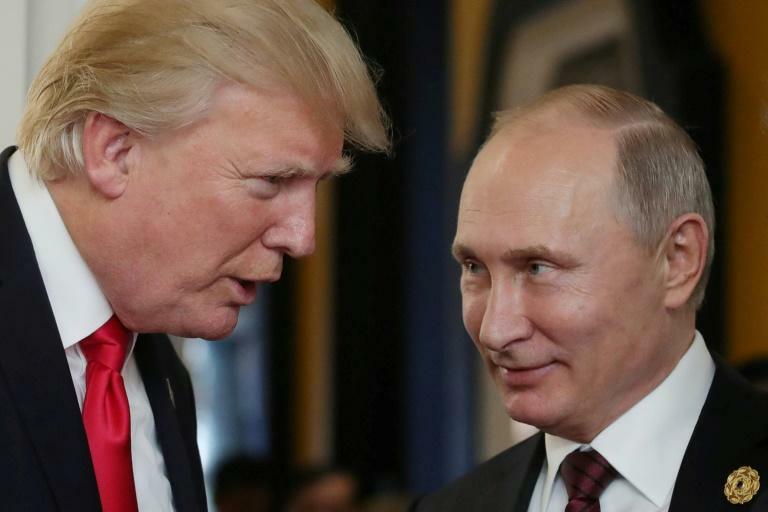 US President Donald Trump stridently defended his much-criticized overtures to Russian strongman Vladimir Putin Wednesday, as White House anxiety over his embrace spilled into full public view. After aides leaked embarrassing details of Trump's shock decision to call Putin and congratulate him on re-election, the US president blamed the media for the furor and insisted Moscow can be a solid partner. "I called President Putin of Russia to congratulate him on his election victory," Trump tweeted. "The Fake News Media is crazed because they wanted me to excoriate him." "They are wrong! Getting along with Russia (and others) is a good thing, not a bad thing," he said, claiming Moscow "can help solve problems with North Korea, Syria, Ukraine, ISIS, Iran and even the coming Arms Race." The tweets left Trump's administration in disarray, holding two starkly contrasting positions on Russia -- one espoused by a Russophile president and another from a cabinet and White House more skeptical of Putin's role. Just minutes before Trump's tweets, the White House staff had suggested that he agreed with President Emmanuel Macron of France on the need to "hold Russia accountable." There was no such sentiment from Trump himself, with the president instead suggesting his warm relationship with Putin could reset relations. "Bush tried to get along, but didn't have the 'smarts.' Obama and Clinton tried, but didn't have the energy or chemistry (remember RESET). PEACE THROUGH STRENGTH!" he tweeted. Aides had been stunned by Trump's decision to call Putin in the first place, but were even more surprised when he ignored their notes warning him explicitly "DO NOT CONGRATULATE" and committed to a summit meeting soon. Trump was also advised to condemn the poisoning of a former Russian spy in Britain. According to accounts from the White House and the Kremlin, Trump did not do that either. The decision by staff to leak of such sensitive information about Oval Office deliberations exposed a deep frustration within the White House about the president's ad-hoc approach and disregard for the advice of his inner circle. Only individuals at the very highest levels of the administration would have known about the details of the call. It is certain to fuel suspicions about Trump's motives. He began Wednesday by railing against special counsel Robert Mueller, who is investigating Trump campaign ties to Russia. Officials, speaking on condition of anonymity, told AFP that a hunt for the leaker was underway. Two sources suggested the documents prepared for the call may have been classified, making unauthorized disclosure a crime. "If this story is accurate," one official told AFP, "that means someone leaked the President's briefing papers. Leaking such information is a fireable offense and likely illegal." The White House chaos emerged as lawmakers heard that Russia -- slapped with US sanctions over its meddling in the 2016 election -- remains a menace as the country gears up for congressional polls in November. "The threat of interference remains," Homeland Security Secretary Kirstjen Nielsen told a hearing of the Senate Intelligence Committee on election security. Democratic Senator Mark Warner fumed that "the president did not even bring up the topic of our election security when he called Vladimir Putin." He echoed earlier criticism of Trump's call by Republican Senator John McCain, who warned on Wednesday that "an American president does not lead the free world by congratulating dictators on winning sham elections." For critics, Trump's call offered Putin legitimacy while giving him a wedge to drive between Western allies and within the White House itself. Allies, most notably in Britain, were furious about Trump's apparent lack of solidarity after double agent Sergei Skripal was poisoned in a small English town. But Republicans also lined up behind the president in anger about the latest leak from the White House. "I don't like that he did it, but you know what I like even less? That there is somebody close to him leaking this stuff out. If you don't like the guy, quit!" said Republican Senator Marco Rubio. Yahoo Poll: How do you save money?